Welcome to our new BBB. This month, fashion influencer @jessalizzi is taking over the blog to bring you her latest bargain picks – designer style straight from the gram without the price tag. Jess’ feed showcases a range of Australian labels with a Parisienne feel. She’s worked with many Australian and international brands and she can’t wait to share her style tips with Spencer Outlet Centre. Spring for me is all about transitional dressing. As the weather begins to warm up, I jump at the opportunity to start wearing dresses and skirts, but never go far without a linen blazer or denim jacket in case the weather takes a not-at-all-surprising-Melbourne-like turn! It is true what they say – Melbourne really does have four seasons per day! As Spencer Outlet Centre’s Style Ambassador, I was given the opportunity to create a couple of Spring-inspired looks using pieces only found at Spencer Outlet Centre. This was indeed a very easy task, as Spencer Outlet Centre has a huge selection of amazing retailers, stocking heaps of new season looks for well below the normal retail price! Both looks I created very much had Melbourne weather in mind and could easily be adapted to suit a colder day with a light jacket or by swapping a skirt for jeans. One of the pieces I really fell in love with was this white little-house-on-the-prairie-inspired top from Cotton On, which is a look that is so incredibly on trend right now and was featured heavily during MFW earlier this month. 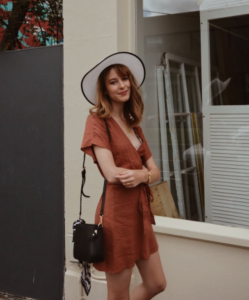 Another item that I really loved was this monochrome hat from TK MAXX – an item that could easily be worn on a picnic or even to the Spring Racing Carnival later this year. The last piece that really took my fancy was the satin silk neck scarf from Rubi Shoes. I wore it here around my bag, but would love to wear it tied around my neck, wrist or in my hair! The fact that Rubi Shoes has this scarf available in literally every colour combination possible is also a real win! Some of the key colours that were seen on the runway during MFW earlier this month were tones such as burnt orange, lilac, beige, shades of pink and camel – colours were worn together and were seen in materials such as silk, linen and cotton. A couple of my favourite designers at MFW were Acler and Viktoria & Woods. Both designers incorporated the key colours of the season and designed looks that were both ready-to-wear and aspirational all in one. I was able to recreate some of these elements using pieces found at Spencer Outlet Centre. Particularly this burnt orange linen wrap dress from Glassons, which showcases a colour/style featured heavily during MFW. Other retailers that I would look to when recreating MFW runway looks would be Bardot, TK MAXX and Portmans! Follow @jessalizzi for more Spencer Outlet Centre fashion inspiration. Discover Spencer Outlet Centre’s stores here.